The assignment brings back painful memories for Kara. She can't forget how she let Zak (Commander Adama's son and her lover) pass Basic Flight when he wasn't ready, and how it ultimately cost him his life. Determined never to repeat the mistake, she flunks out the would-be pilots on their first day. She is immediately confronted, first by Lee, then by Adama, and forced to admit to the Commander her role in Zak's death. Adama orders her to continue training the "nuggets." Meanwhile, Sgt. Hadrian continues her investigation into the detonators found in Sharon's spacecraft, and President Roslin consults the ship's doctor about her cancer. - Zak Adama is played by a different actor than the one that portrayed him in the miniseries. - Commander Adama at one time served on board the Battlestar Atlantia and made his 1000'th landing on that ship. - There are two civilian flight instructors in the fleet. - Costanza (Hot Dog) is played by Bodie Olmos, Edward James Olmos' son. - Hot Dog washed out of the Colonial Fleet Academy. - According to Apollo, there are 40 vipers and 21 pilots aboard Galactica as of this episode. The pilots figure probably does not include the nuggets. - According to Apollo, the fleet is still in the process of mining water. - A great deal more pilots were to be killed than actually were in the episode, but the network complained, so they scaled it down. - The actor who plays Dr. Cottle originally auditioned to play Colonel Tigh. - The happy, ceremonious, playful atmosphere at the beginning of the episode. - Roslin's first meeting with Dr. Cottle. I love the obvious irony of a doctor coming in and lighting a cigarette in front of a cancer patient. She even asks him to put it out and he refuses and keeps on smoking! - Kat blowing a landing. - Apollo accidentally hinting to Adama that Starbuck felt guilty for something she did for Zak. - Starbuck revealing to Adama that she passed Zak even though he should have failed his final flight test. - Starbuck taking on all eight Cylon fighters and Hot Dog turning to help her. 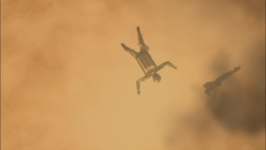 - The battle resulting in Starbuck's ejection and crashing into the moon. Here is an episode that works well but loses something in the style department. First and foremost, showing Starbuck ejecting from her viper so many times throughout the story was just completely unnecessary and should have been totally omitted. I can't stand flash forward storytelling, or episodes in which the ending is shown first then the events which led up that ending follow. It's needlessly distracting and doesn't really serve a purpose to begin with. Also, while by and large the flashbacks to the past were extremely well done and woven in nearly perfectly into the present scenes, some of the material was repetitive and redundant. That combined with Starbuck ejecting from her viper repeatedly tended to waste a lot of the episode's time. Aside from that, the main plot of the senseless death of so many viper pilots was quite moving. As if the Galactica didn't already have a huge shortage of personnel, this is a severe kick in the face. The pragmatic approach of the plot is also quit sobering. "Okay, we just lost a dozen pilots. Time to train more!" However, I think it goes without saying that the scene in which Starbuck admits her sin to Adama is the centerpiece of the episode. I loved both actors' performance in this scene. Everything from Starbuck breaking down and crying to Adama being driven to the point of fury was magnificent. That scene was truly milked for all it was worth. Another detail worth mentioning is how they're still busy mining the water from the ice moon and it's because they've been stationary so long at a place with natural resources that the Cylons have been able to find them. Without the water crisis, the fleet wouldn't be in this planetary system. Without being in this planetary system for so long the Cylons probably would not have found them and Starbuck would not have crashed onto that moon. The direct interconnectedness of all these events is quite well done. Finally, the space battles in this episode were their typical levels of gorgeously outstanding. Overall another solid episode. I really hate the flash forwards in the title sequence. "On The Beach" (1959) has a similar storyline (and outcome) about a mysterious signal coming from a post nuclear radioactive city.